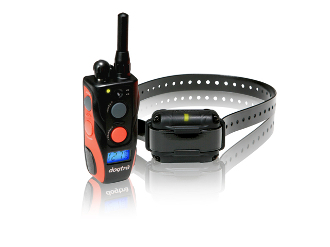 The SureStim M Plus is expandable, up to a two-dog system, and features a positive vibration feedback in the handheld Transmitter, acknowledging that you have fully engaged the Transmitter buttons, perfect for low visibility or training with gloves. It also features a ½-mile range, rechargeable batteries, fully waterproof Receiver and Transmitter, and a low to medium stimulation output. 1 Receiver/Collar (5/8"contact points, which are standard) Please add comments if you'd like a different size. Pager Mode (Vibration) - Yes for Transmitter and Receiver.